NPR1 may act as a substrate-specific adapter of an E3 ubiquitin-protein ligase complex (CUL3-RBX1-BTB) which mediates the ubiquitination and subsequent proteasomal degradation of target proteins. NPR1 is a key positive regulator of the SA-dependent signaling pathway that negatively regulates JA-dependent signaling pathway. NPR1 mediates the binding of TGA factors to the as-1 motif found in the pathogenesis-related PR-1 gene, leading to the transcriptional regulation of the gene defense. NPR1 controls the onset of systemic acquired resistance (SAR). Upon SAR induction, a biphasic change in cellular reduction potential occurs, resulting in reduction of the cytoplasmic oligomeric form to a monomeric form that accumulates in the nucleus and activates gene expression. The phosphorylated NPR1 is a target for proteasome degradation. Rabbit polyclonal antibodies were produced by immunizing animals with a GST-fusion protein containing the middle region of arabidopsis thaliana NPR1 (AT1G64280). Antibodies were purified by affinity purification using immunogen. Fig 1. A) Western blot analysis of protein extracts prepared from adult leaves of wild type (WT) and transgenic Arabidopsis plants expressing GFP-NPR1 protein (GFP-NPR1), using anti-GFP (M0802-3a) or anti-NPR1 (M2) (R3506-3) at RT for 2 h as indicated. 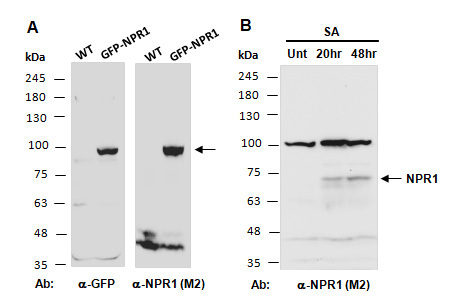 B) Western blot analysis of equal amounts of protein extracts from wild type Arabidopsis leaves untreated (Unt) or treated with 1mM salicylic acid (SA) for 20hr or 48hr as indicated, using anti-NPR1 (M2) (R3506-3) at RT for 2 h.